LAS VEGAS -- Johny Hendricks has shared the Octagon with the likes of Georges St-Pierre, Robbie Lawler and Carlos Condit. As it turned out, those battles were easy compared to sharing it with Stephen Thompson. Thompson (12-1) dominated the former welterweight champion Saturday, knocking him out with right hands at 3:31 of the opening round. The 170-pound bout headlined UFC Fight Night at MGM Grand Garden Arena. A former NCAA champion wrestler, Hendricks (17-4) tried to close distance on the rangy kickboxer but repeatedly walked into counter punches. He failed to secure a single takedown and landed 11 total strikes compared to Thompson's 25, according to Fightmetric. The finish came after Hendricks came up well short on a straight left hand. Thompson stepped slightly out of range and came back with a big counterpunch. After Hendricks retreated to the fence, Thompson threw a spinning kick that left him wobbled and referee John McCarthy stepped in shortly after. "That's exactly what I planned to do," said Thompson, who fights out of Simpsonville, South Carolina. "I knew he was going to try and get me to the cage, use his hands to get to the fence and try to get the takedown. I didn't look for the knockout, I just let it happen. "He kept coming and I knew he would until he ran into something." The win improves Thompson's UFC record to 7-1. His only loss came in his second appearance in April 2012, via unanimous decision to Matt Brown. "I came here to put on a good show," Thompson said. "Hopefully the fans were impressed and hopefully next, we can get that title belt, baby." Hendricks, who trains out of Dallas, falls to 2-3 in his last five bouts. The 32-year-old won the UFC championship in March 2014 but surrendered it nine months later to current titleholder Robbie Lawler. Before this weekend, he was coming off a weight cutting failure in October during which he was hospitalized. His bout against fellow welterweight contender Tyron Woodley was canceled as a result. He worked into the clinch early Saturday, but Thompson defended a single leg takedown and eventually disengaged. Hendricks appeared to struggle badly with Thompson's size. A former world champion kickboxer, Thompson enjoyed a six-inch reach advantage. "I hesitated," Hendricks said. "Whenever I closed the distance, he moved away. When I thought the cage would be there, it wasn't. He bounced off it very well. Hat's off to him. What else can I say? He did an awesome job. I'll be back. It's a new start. You've just got to move forward." Heavyweight Roy Nelson (21-12), out of Las Vegas, snapped a three-fight skid by defeating former All-American collegiate wrestler Jared Rosholt (14-3) via unanimous decision (30-27, 30-27, 29-28). Nelson landed the harder strikes and defended several Rosholt takedown attempts. He never hurt Rosholt but consistently walked him down and was far more aggressive. Rosholt, who fights out of Arlington, Texas, suffered his first loss in four appearances. Light heavyweight Ovince Saint Preux (19-7) picked up a rather ho-hum victory as he outpointed a badly fading Rafael Cavalcante (12-7) via unanimous decision (30-27, 30-27, 29-28). Saint Preux looked as if he was nursing a foot injury early but still managed to dominate the 35-year-old Cavalcante, who didn't offer much in terms of offensive output. Saint Preux moves to 7-2 in the UFC, and Cavalcante drops to 1-4. Two-time flyweight contender Joseph Benavidez (24-4) extended his win streak to five in a unanimous decision (30-27, 29-28, 39-28) over Zach Makovsky (19-7). Benavidez mixed his striking well in the bout, targeting Makovsky to the body and head. He caused Makovsky's left eye to swell in the third with a big right hand. His only two losses in the UFC have come to defending champion Demetrious Johnson, in 2012 and 2013. Light heavyweight Misha Cirkunov (11-2), originally from Latvia and now fighting out of Toronto, submitted newcomer Alex Nicholson (6-2) at 1:28 of the second round via neck crank. A black belt in judo and Brazilian Jiu-Jitsu, Cirkunov took Nicholson down repeatedly, eventually moving to his back after one scramble and locking in the submission. The 28-year-old moves to 2-0 in the UFC. Welterweight Mike Pyle (27-11-1) picked up a TKO victory against Sean Spencer (12-5) at 4:25 of the third round. Pyle, 40, survived an early knockdown in the first round and eventually put it on the 28-year-old Spencer late, rocking him with a spinning elbow and knees against the fence. The win snaps a two-fight skid for Pyle -- which was, amazingly, the first losing streak of his 16-year career. 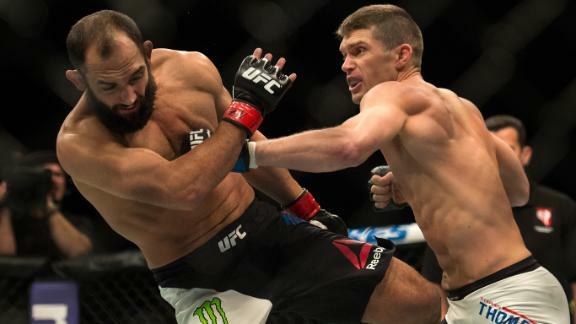 Stephen Thompson finishes Johny Hendricks via knock out with a number of right hand strikes in the first round.